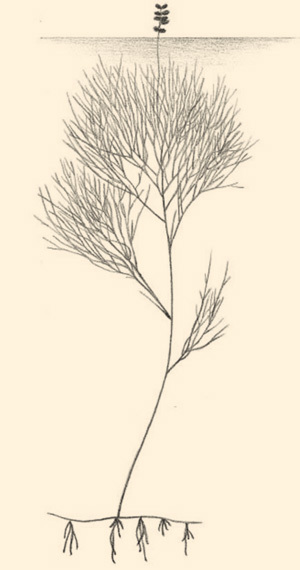 Sago Pondweed (Potamogeton pectinatus) has very fine slender leaves. Multiple long thin leaves appear bushy beneath the water. When removed from the water the plant will relax with little or no rigidity. In temperate climates, sago is one of the first submersed plants to begin spring growth. Elongation begins in various hibernating organs when water temperatures reach about 10 C--from late March to late June in the Northern Hemisphere. Plants reach the water surface in May to mid-July, and, about 2 weeks later, healthy stands can cover much of the water surface. Plants can reach the water surface more rapidly under low light conditions common in eutrophic or brackish waters. 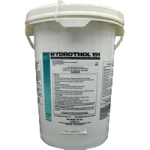 Hydrothol 191 Granular is our recommendation. 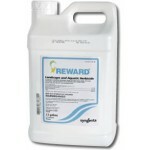 Other effective herbicides on Sago are Aquathol Super K granular and Reward liquid herbicide. Sago is so flaccid that it does not cut very well; raking a small area is preferred. 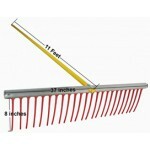 See Water Weed Rake. Generally, there is little regrowth within the same season. 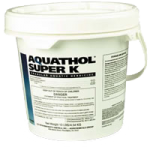 Note that other aquatic species like the Naiad family grow later in the season that may require a mid to later season treatment to achieve season long clear water. A.Generally within two weeks things will be cleared up.